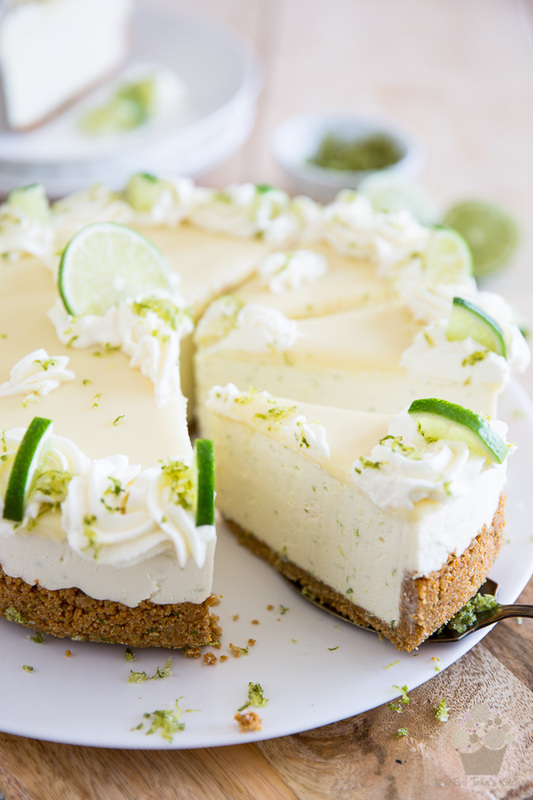 This No Bake White Chocolate Lime Cheesecake is a cross between a Key lime pie and a creamy, no bake cheesecake. The result? Your perfect summer dessert !! The texture of the filling is bang on: firm enough to hold its shape, but still super creamy and melt-in-your-mouth velvety. 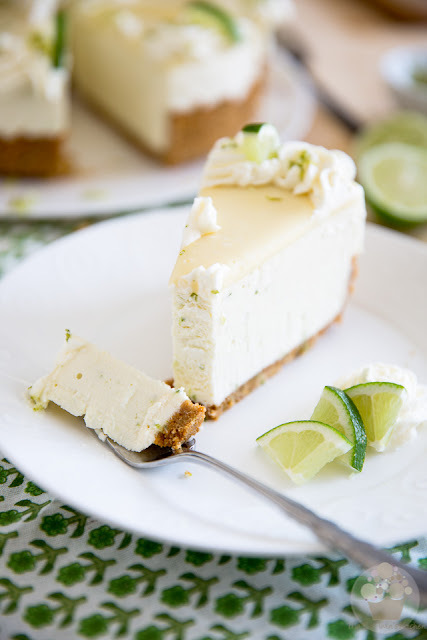 The tanginess of the lime and cheese coupled with the delicate sweetness of the white chocolate complement each other so well, it’s like they were created to be together. The crust adds this tiny little hint of crunch to the experience, without taking up too much space. It just gives your teeth a little something to keep them busy while your tongue and palate are working on the softer components. And finally, the white chocolate ganache that covers the cake gives the whole adventure a graceful, voluptuous and silky finale. Honestly, I’m usually a fan of serving cakes at room temperature, but this one would be an exception to that rule. I found it to be particularly amazing straight out of the ice box, making it the perfect dessert for summer. Well, not only because of that, but also because it doesn’t require the use of the oven, and because it tastes so crazy refreshing, too! It just TASTES like a beautiful, warm and sunny summer day. Start by zesting, then juicing 8 limes. I strongly recommend that you use a microplane zester and a 2 in 1 lime and lemon sqeezer. These tools will make your life a whole lot easier! Combine the graham cracker crumbs, brown sugar, melted butter, vanilla extract, salt and about 2 tbsp of the lime zest in a large mixing bowl. Mix until well combined and press firmly at the bottom and about halfway up the side of the prepared pan. Set aside. Place the sheet gelatin to soak in a large bowl filled with icy cold water (if using powdered gelatin, sprinkle it over 1 cup of fresh lime juice so it has a chance to bloom). Whip the heavy cream until firm peaks form and reserve. Melt the white chocolate in a small mixing bowl and set aside. In a large mixing bowl, combine the cream cheese and sugar and mix on high speed with an electric mixer for about 2 minutes, until light and fluffy. Add the condensed milk and about 3 tablespoons of lime zest and resume beating until well incorporated. Pour in the melted white chocolate and mix on high speed until combined. Warm the lime juice over very low heat or in the microwave until barely just warm to the touch (and until gelatin is completely melted, if using powdered gelatin). It's important that the lime juice doesn't become hot or it would hurt/destroy the gelatin; lukewarm is what you're after. Remove the sheet gelatin from the water bath and squeeze it between your fingers to remove as much water as possible. Add the gelatin to the warm lime juice, stir until fully dissolved and then pour this into the cream cheese mixture. Resume mixing until it's well incorporated, then delicately fold in the whipped cream. Pour onto the reserved crust and spread evenly all the way to the side of the pan. Gently tap the side of your pan and give it a little shake to help the top settle and smooth out. Place your cake in the fridge until completely set, about 6 hours or better yet, overnight. In a small mixing bowl, combine the white chocolate and whipping cream and place that in the microwave for 30 seconds. Allow to rest for 30 seconds and then stir for 30 seconds. If there are still lumps of unmelted chocolate, repeat the process but for 20 seconds this time, and continue doing that until the chocolate is completely melted but not hot, and the ganache is well combined. Pour this right over the cheesecake and tilt the pan in a circular motion to spread the ganache all the way to the egde; tap the sides and give the pan a little shake like you did before to help make that top really smooth and even. Put the cake back in the refrigerator for about 15 minutes, until the ganache is set. Take the cake out of the pan and place it on a cake plate or stand. In a small bowl, combine a tablespoon of grated lime zest with an equal amount of granulated sugar and mix well; Decorate the cake with swirls of whipped cream (I used an open star Ateco #2) and sprinkle some of the sweetened zest over the rosettes, then garnish with slices of lime.